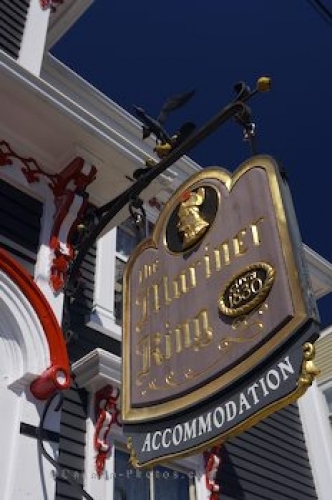 A historic sign outside the Mariner King Accommodation in the town of Lunenburg, Nova Scotia, attracts the attention of tourists looking for a place to stay. The Mariner King Accommodation is situated in the centre of this historic town and is within walking distance to the shops, restaurants, attractions and the waterfront. Picture of the sign outside the Mariner King Accommodation in the Lunenburg, Nova Scotia. While walking through this historic town, the sign for the Mariner King Accommodation is easy to find and one worth locating. The beautiful accommodations add the extra luxury one needs to full enjoy your stay while traveling Nova Scotia, Canada and seeing this historic town. Sign outside the Mariner King Accommodation (originally built for Dr Charles Bolman ca 1830) in the town of Lunenburg, UNESCO World Heritage Site, Lunenburg Harbour, Lighthouse Route, Highway 3, Nova Scotia, Canada. Lunenburg was established in 1753.